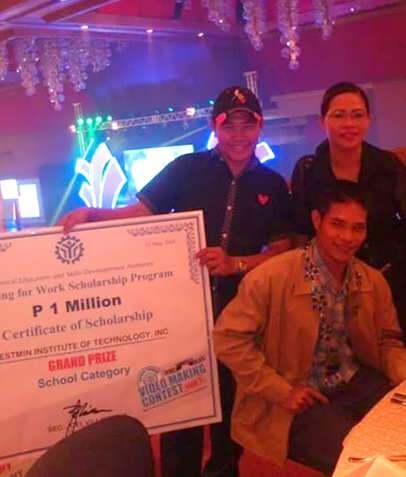 Celso O. Pobadora, representing Region IX, bagged the Best in Story and Grand Prizes during the Tatak TESDA Video Making Contest Year 2 awarding ceremony last May 12, 2015 held at the Philippine International Convention Center in Pasay City. The winners, chosen from over a hundred entries, took the spotlight as they received cash prizes, scholarship vouchers, plaques of recognition and trophies. "The goal of the annual awards was to gather, highlight and lend a platform to the tech-voc graduates for sharing their success stories," TESDA Director General Joel Villanueva said. "These people beat the odds and rose to the top on their own terms. We want their messages to be seen and to resonate, so they would fire up the youth," he said. The objectives of Tatak TESDA Video Making Contest are: to document success stories of TVET graduates, promote TVET through testimonials from TVET graduates using digital and social media, give recognition to successful TVET graduates and create greater awareness on TESDA and its programs and services. The representative for TESDA Region IX was selected by a panel that included Reymond M. Ledesma from Vista de Lente Studio, BhongSimbahon from Radio Mindanao Network and Jocelyn C. Wee, RFASD Chief, TESDA Region IX, last April 10, 2015. Celso O. Pobadora currently works as Automotive Mechanic at the Westmin Automotive and Motorcycle Repair Shop in San Jose, Imelda, ZamboangaSibugay. He completed the qualification for Automotive Servicing NC II at the Westmin Institute of Technology, Inc. in San Jose, Imelda, ZamboangaSibugay during the periods July 14, 2014 to September 27, 2014 and serves as an Assistant Trainer for the said institute.